Immigration status. Seven-in-ten Peruvians (69.3%) in the United States are foreign born compared with 38.1% of Hispanics and 12.5% of the U.S. population overall. Two-thirds of immigrants from Peru (66.1%) arrived in the U.S. in 1990 or later. Four-in-ten Peruvian immigrants (42.3%) are U.S. citizens. Language. A majority of Peruvians (55.1%) speak English proficiently.2 Some 44.9% of Peruvians ages 5 and older report speaking English less than very well, compared with 37.3% of all Hispanics. Age. Peruvians are similar in age to the U.S. population and older than Hispanics overall. The median age of Peruvians is 35; the median ages of the U.S. population and all Hispanics are 36 and 27, respectively. Marital status. Peruvians are more likely than Hispanics overall to be married—50.7% versus 46.5%. Fertility. Two-in-ten Peruvian women (19.6%) ages 15 to 44 who gave birth in the 12 months prior to the survey were unmarried. That was less than the rate for all Hispanic women—38.8%—and the rate for U.S. women—34.5%. Regional dispersion. Peruvians are more geographically dispersed than other Hispanic origin groups. Two-in-ten Peruvians (19.8%) live in Florida and one-in-six (16.8%) live in California; some one-in-eight live in New Jersey (12.9%) and New York (12.3%). Educational attainment. Peruvians have higher levels of education than the Hispanic population overall. Some 29.8% of Peruvians ages 25 and older—compared with 12.9% of all U.S. Hispanics—have obtained at least a bachelor’s degree. Income. The median annual personal earnings for Peruvians ages 16 and older were $24,441 in 2008; the median earnings for all U.S. Hispanics were $21,488. Poverty status. The share of Peruvians who live in poverty, 9.5%, is lower than the rate of the general U.S. population (12.7%) and the rate among all Hispanics (20.7%). Health Insurance. Three-in-ten Peruvians (30.2%) do not have health insurance compared with 31.7% of all Hispanics and 15.4% of the general U.S. population. Additionally, 20.0% of Peruvians younger than 18 are uninsured. Homeownership. The rate of Peruvian homeownership (50.1%) is similar to the rate for all Hispanics (49.1%) but lower than the 66.6% rate for the U.S. population as a whole. 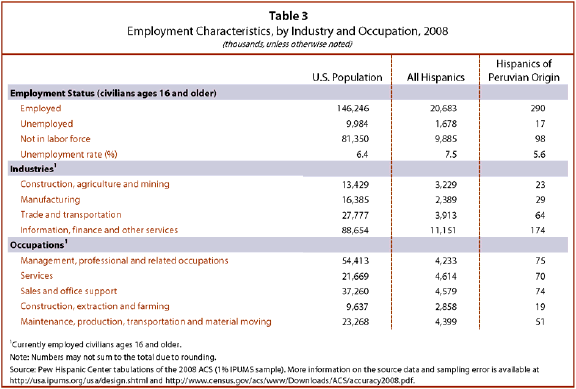 This statistical profile of Hispanics of Peruvian origin is based on the Census Bureau’s 2008 American Community Survey (ACS). The ACS is the largest household survey in the United States, with a sample of about 3 million addresses. 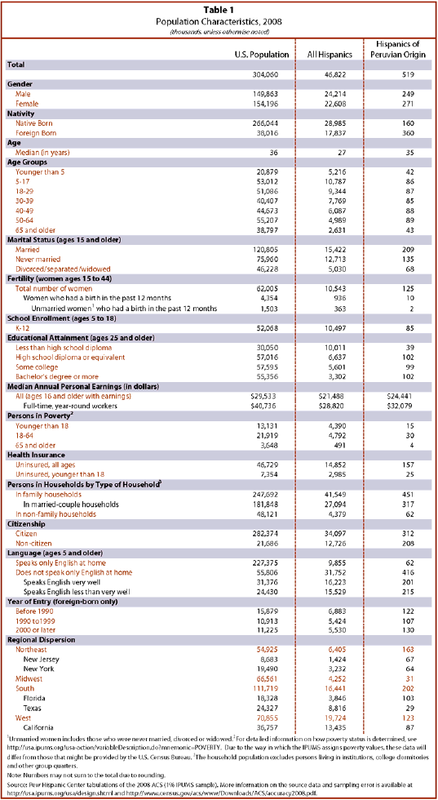 The data used for this statistical profile come from 2008 ACS Integrated Public Use Microdata Series (IPUMS), representing a 1% sample of the U.S. population. Like any survey, estimates from the ACS are subject to sampling error and (potentially) measurement error. Information on the ACS sampling strategy and associated error is available at www.census.gov/acs/www/Downloads/ACS/accuracy2008.pdf. An example of measurement error is that citizenship rates for the foreign born are estimated to be overstated in the Decennial Census and other official surveys, such as the ACS (see Jeffrey Passel. “Growing Share of Immigrants Choosing Naturalization,” Pew Hispanic Center, Washington, D.C. (March 28, 2008)). Finally, estimates from the ACS may differ from the Decennial Census or other Census Bureau surveys due to differences in methodology and data collection procedures (see, for example, http://www.census.gov/acs/www/Downloads/Report10.pdf and http://www.census.gov/acs/www/Downloads/ACS/ASA_nelson.pdf).